Get the best IT and Business trainings with our Courses to fit your End-of-Year Budget. 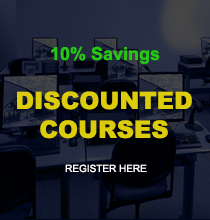 From 2D to 3D, Audio to Video, Animation to Virtual Reality, Networking to Security, Concept to Design, Business Process & Application; all classes delivered by experienced certified instructors in Instructor-led Classroom or Live Online training environments. Check below to view our discounted courses and promotional sales to take advantage of your end-of-year budget.